Flash Business Solutions has over 30 years experience in delivering our clients customized solutions to their business printing, promotional products, and office supply needs. Our comprehensive product mix, distribution capabilities, along with an easy to use e-commerce system, has enabled us to be the "One-Stop Solution" for both large and small companies. Our sales and customer support team can provide you with the expertise you need to help you control your costs with quality products and fulfillment services. View this short video to learn more about us and our powerful e-commerce online ordering solution. The holidays are a time to celebrate, spread joy, and in the process, strengthen your relationships. 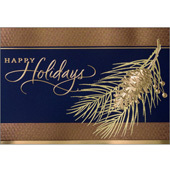 Our Business Holiday and Corporate Greeting cards help you do that at a cost-conscious price.